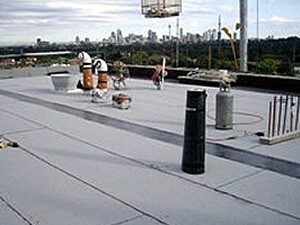 Flat roofing is notorious, both in the commercial and residential sectors, for leaks. Due to its nature there is no pronounced run-off from a flat roof encouraging water to pool and, through lack of regular inspection and maintenance, the joins between sheets of the roofing material used can degrade leading to water ingress. This is particularly compounded over time. Identifying the source of the problem can also be problematic with capillary action leading to water that has entered via the roof appearing in the structure below at another point, not directly corresponding with the flaw in the roofing above. At Integral Roofing Maintenance Services Ltd we have extensive experience in dealing with flat roofing and strongly recommend a regular schedule of proactive inspection and maintenance to identify and rectify problems as they arise, in particular with regard to flat roofs. Once we have inspected your flat roof we will advise you of the best course of action to both give best return on investment and minimise disruption to the business operating from the commercial premises. Fortunately, there are a wide-range of options for repairing flat roofs without it being necessary to completely replace the structure; although this may be necessary in extreme cases. Relining a roof with a single-ply membrane or applying a coating of liquid bitumen are two of the more common options but, depending upon the nature of the roof concerned, out expert staff will be able to provide the appropriate service for all commercial properties.